In this paper we first present stability and error analysis of the fully discrete numerical schemes for general dissipative systems, in which the implicit Runge–Kutta (IRK) method is adopted for time integration. Under suitable conditions on the IRK time stepping method that we refer as the total stability, a priori error estimates can be simultaneously obtained. 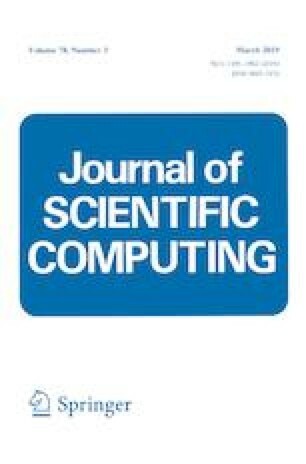 Then we apply such time-marching techniques and analysis framework to one-dimensional time-dependent nonlocal diffusion problems, together with the discontinuous Galerkin method being used for spatial discretization. Unconditional stability of approximations of both primal and auxiliary variables and the priori error estimates for the corresponding fully discrete systems are proved, and the results indicate the schemes are asymptotically compatible. In addition, long time asymptotic behavior of the approximate solutions is also investigated. Various numerical experiments are finally performed to verify the theoretical results. Qiang Du’s work is partially supported by US National Science Foundation Grant DMS-1719699, US AFOSR MURI Center for Material Failure Prediction Through Peridynamics, and US Army Research Office MURI Grant W911NF-15-1-0562. Lili Ju’s research is partially supported by US National Science Foundation Grant DMS-1521965. Jianfang Lu’s work is partially supported by Postdoctoral Science Foundation of China Grant 2017M610749, and Natural Science Foundation of China Grants 11771035 and U153040.